Digital Transitions’ DT RG3040 Reprographic System was developed to meet the high demands of the cultural heritage digital imaging community while protecting the integrity of the materials. 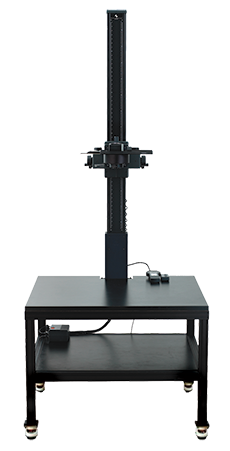 This system, with its electronically controlled column, fully aligned components, and casters with adjustable and retractable dampeners optimizes ease of use while ensuring the creation of superior digital images every time. The DT RG3040 Reprographic System is also designed for use with virtually any camera, lens, or shutter system in order to prevent obsolescence. A 30” x 40” reprographic table with a heavy duty, moveable electronically controlled column. Fully aligned components CNC (Computer Numerical Controlled) machined to 0.005” to ensure even focus across image plane. A utility shelf to hold lighting generator and camera accessories. Four casters with adjustable and retractable dampeners for mobility, work surface alignment, and elimination of table vibration. This ensures the highest quality reproduction.